Dr. Mubarak Ali - PhD (on Mughal Period, India) from Ruhr University, Bochum, Germany. Former head of history department of Sindh University - Pakistan. He was the director of the Goethe Institute in Lahore, until 1996. In every religion there occurs, from time to time, a revivalist movement that seeks to purify the religion of irreligious and polluted practices and rituals. Those who undertake this task, generally adopt two methods: One is to persuade the faithful to understand the original teachings and follow them; the other is to coerce and force them to abandon heretic practices and accept the extremists’ version of religion. This creates two points of view in society: one is the evolutionary concept of religion in which cultural practices are integrated without any contradiction into the original teachings of religion. In the other, all those practices which are not according to the original teachings are deemed irreligious and eliminated. The movement for purification which was launched by Christianity in the 12th and 13th centuries was different because it was led by the church and not by any individual or group of extremists. The church, as an institution, realised that many non-Christian practices were distorting the teachings of Jesus Christ. These were the practices which the people of Europe inherited from the Roman society and its culture and continued to observe them even after their conversion to Christianity. At the same time some sects emerged whose ideologies were contrary to the policy of the church. In the eyes of the church all such attempts were profane; therefore, it was decided to bring them back to the fold, first by persuasion, and if that did not work, then by coercion and force. The Dominicans, a religious order founded in 1216, and the Franciscans, founded in 1209, were assigned the task to suppress heresy with the help of the inquisition. 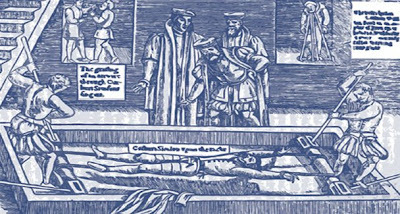 In 1252, torture was sanctioned to extract confessions. This empowered the inquisition authorities to use torture in the name of religion, believing that they were working for a higher spiritual cause. The Inquisition officers visited villages carrying crucifixes as an emblem of religious authority; after gathering inhabitants together they delivered a sermon and then asked them to identify the heretics and those who committed religious offences. A one month period of grace was given to confess and recant heresy; those who did not change their ways during this period were brought before the inquisition court for trial. Those who confessed their sin were allowed to come to the fold. Those who refused were tried. First they were denounced by the local church and their neighbours, then two witnesses were rounded up to prove their act of heresy. Generally, the names of the witnesses were kept secret. Sometimes their testimony was recorded under threat of torture or bribery. Trial began with torture which included the use of iron boots, thumbscrews and flogging. With the passage of time more innovative methods of torture were invented by the authorities. Such was the fear that nobody dared to say a word in favour or in defence of the victim. Heresy was a charge which could be easily applied by the inquisition authorities against anyone. If a person was wealthy, his property and wealth were confiscated. Moreover, he had to pay all the expenses of his trial. If he was found guilty, the verdict was announced in public and the victim was handed over to secular authorities to execute the punishment. Generally, the punishment was to burn at the stake. We find in the history of inquisitions that rich and propertied people and those who were pursuing scholarly studies were often hunted by religious authorities. By prosecuting rich people the church sought to confiscate their wealth and enrich itself; scholars and scientists became victims because they were suspected of undermining the teachings of the church by encouraging free thinking which could become a challenge to its authority. In 1492 when Spain was conquered by the Christian powers, Muslims and Jews were asked either to convert or leave. Those who converted to escape from persecution were closely watched by the Spanish Inquisition. They were tortured and forced to confess that they had misled the authorities by false conversion. Even the Knights Templar, who were a product of the Crusades and had established their credentials as the true followers of Christ, could not save themselves from the inquisition. The order had become very influential through accumulation of immense wealth and hence became a challenge, not only to the church but also to the rulers. They were declared heretics, their wealth was confiscated and they were burnt at the stake. However, Pope Sixtus IV realised that the reputation of the church was being maligned due to the inquisitions. Therefore, he wrote a letter to Ferdinand V of Castile saying that: “The inquisition has been moved not by zeal for faith but by lust for wealth” and that “many true and faithful Christians have without any legitimate proof been imprisoned, tortured and condemned as heretics.” However, such was the influence and power of inquisition that in spite of the Pope’s doubts, it continued its function, until being gradually abolished, through 1758 to 1820.